AM- 64º/69%, nice running weather. 6 Recovery miles, my quads are shot. PM- 73º Nice. More recovery miles, quads still stiff. 2 Mile w/u- then 18 (MP goal 7:40) - 7:28, 7:29, 7:29, 7:39, 7:39, 7:46, 7:31, 7:32, 7:36, 7:41, 7:39, 7:24, 7:22, 7:46, 7:37, 7:37, 7:33, 6:41 - I wanted to see what I had left for mile 20, so I am pleased with some ChuckRoastish. Off to the Fair at New Boston! Good times and food await! 68° Starting to warm back up, heat wave coming. 11 Days to the marathon. Taper mode enagaged. AM- 72º and sticky. I either have the worst allergies in 10 years or I have a sinus cold out of the blue. Ran with a cough drop. Marathon in 10 days, taper mode here- now to make sure I am healthy race day. It's just odd, I never get sick while training. After a marathon sure, I am not sure what hit me, but I feel terrible. I think my nose is running faster than me. AM- 71º/100% Humidity... Went to the docs yesterday. I figured I was too close race day to take any chances. Glad I went, but I had the trifecta of issues. Bacterial infection, viral infection and allergies. Awesome. However, doc was confident he would have me ready for race day. Lots of meds. 6 easy, yet not easy. Wet. Just a tune up for next week. Marathon is 7 days. Still not feeling well, but the meds are definitely working. What a different a week makes in conditions though. Last week, ideal conditions, STRONG run. And while today I just wanted a few fast miles to keep my legs honest a 20 degree hike in temps made that a chore. 74º/88%/70 4 Easy, 4 HMP/10K pace, 4 Easy. A coughing fit at the end of mile 7 made mile 8 and 9 more difficult that it should have been. At the end though it seemed like a short run. I think that is a good sign. Next weeks forecast is not promising, but things can change rapidly. 58º Teeth hurting from the sinus infection. Progessively faster without effort. Got my first Alert email from the marathon. Potentially dangerous heat/humidity levels for the race. Sigh. Oh well, its the 20th aniversary, I can run for fun if needed. AM-55º More nice weather that is not here to stay. 4 Easy then 2 fast to keep me honest and 2 cool down. Still coughing. Preparing. 62º 4 Miles. Progressive w/o effort. Coughing was less and teeth pain reduced. Good. 2 Mile pre marathon shake out. Up early, oatmeal on and drugged up. Wasn't feeling the best, but I was confident if the meds did their job I could do mine. They pushed the start back to 8am due to some lighting -however most of the runners were not happy with this since that lightening was at 5am. It was about 72º and very humid. Race started and mile 1 went off without a hitch. Pace was fine breathing slightly labored, but nothing I couldn't handle. By mile 3 I was having huge issues breathing and trying to figure out how to fight through it. 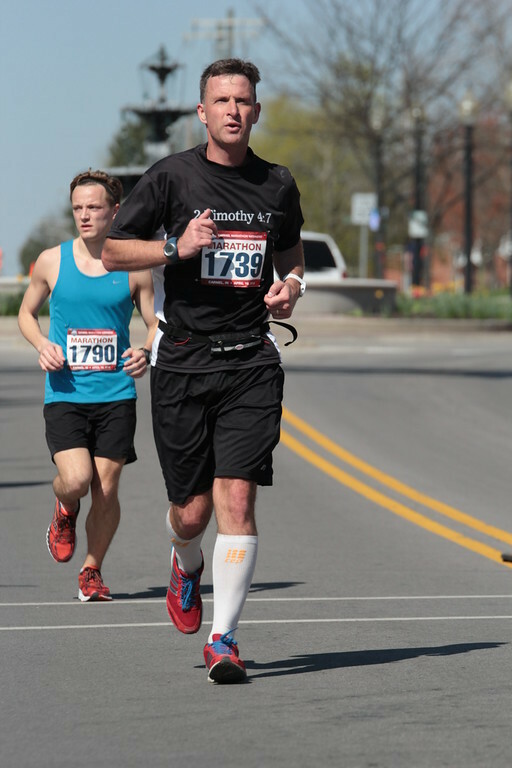 By mile 7 I was toast. Vomiting, nose, lungs all fighting against me. Holding a pace was not in the cards and honestly I was just too dizzy so I just stopped in the medical tent. I have never not finished a race so there is a 1st time for that. I will look at the bright side and know I will have a fast recovery. I also in a weird way thankful this was at mile 9 and not 19. At 19 I know I would have pushed on and that could have been worse overall for me. Another day perhaps... now to get well. On the road. Still trying to get well. 84- very warm. Went to a park south of Columbus. Showing signs of feeling OK. I think. Ran trails.... 8.5 with some mile repeats. Saw some huge deer, 11 Bison here, Indian burial mound, lots of hills with packed gravel, Tired, but needed something. 80- 3.5 Easy. Back home tonight. Not not 100%. However, improving. I think. 7 easy. warm and wet still. 82, hot. Trying to run through this stupid thing. 80, warm. Needed an afternoon boost. AM- 72º Wet. Teeth hurting again from sinus infection. There is an new marathon Saturday. I wonder if I still have enough fitness to run it strong. I know I could finish, but I'd like to race it, I just wonder if I lost too much fitness these past 3 weeks. 7, felt better. Of course 55 degrees makes that happen. 63 with a cool rain. 13 x 20s striders @ 5k pace. Overall an okay run.